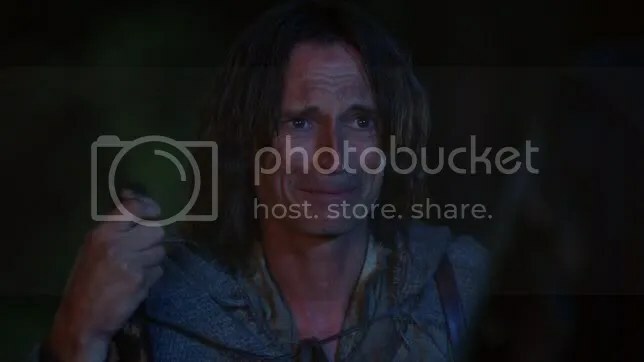 This week our two story lines follow the making of Rumpelstiltskin into the monster we know and secretly love, and Emma competing against Regina’s scheming in the elections for sheriff. It seems like it would make for a rousing story, but it’s a pretty standard “power corrupts” allegory that falls flat. The show has a lot of making up to do for killing my beloved Graham; so far I’m still holding a grudge. We start in the Enchanted Forest, where soldiers are kidnapping local children to fight in the war against the ogres, and as soon as a human Rumpelstiltskin’s son turns 14, he’s next. They attempt to flee, but are stopped by soldiers who are quick to assault Rumpelstiltskin and remind he is a coward who fled from battle, effectively ruining his son’s opinion of him. They are helped home by a creepy beggar (played by the master of creepy characters, Brad Dourif), who just happens to know the Duke is controlling the “Dark One” with a mystical dagger – a dagger Rumpelstiltskin could use to gain power. He spouts some nonsense to his son, saying he would use the power for good. In a shoddy bit of writing (setting fire to a stone keep with wooden floors and no guards? 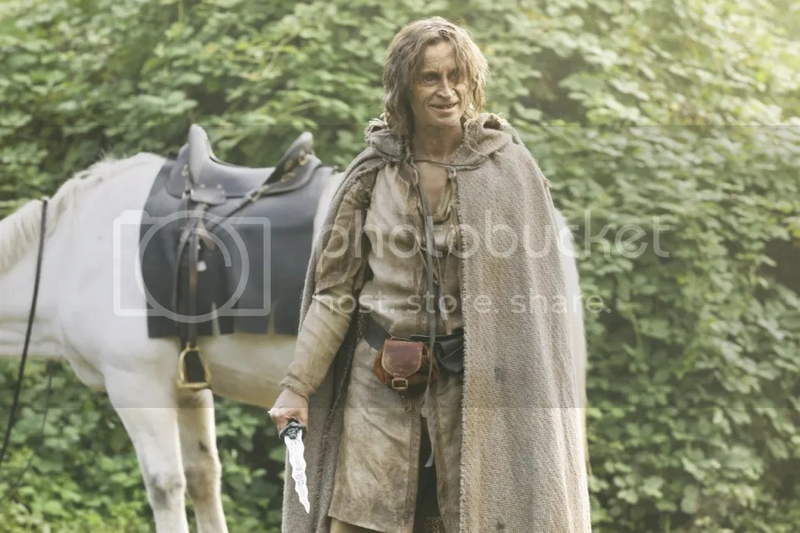 ), Rumpelstiltskin gets the dagger. He then summons the Dark One, who goads Rumpelstiltskin into killing him and taking his powers. The Dark One is of course the beggar, who found a “desperate soul” to relieve him of the burden of his magic, which as we know, “comes with a price.” As the soldiers arrive to take his son, Rumpelstiltskin uses his newfound malice to quickly dispose of them. Last we see him, he’s stalking menacingly towards his son, dagger in hand. In Storybrooke, two things have happened since Graham’s death – Emma is up for sheriff and Henry he wants to end “Operation Cobra” before the hero, namely Emma, dies. Emma is about to pin on the sheriff’s badge when Regina walks in and tells her Sidney Glass, the local reporter, will be taking the post instead. Later, Mr. Gold appears with copy of the town charter, claiming Regina is a common enemy, and a frustrated Emma agrees to an alliance. According to the charter, they must hold elections, and the race is on. The mayor starts playing dirty by revealing more of Emma’s sordid past in the newspaper – namely that Henry was born in jail. But when Emma goes to confront Regina, a mysterious fire starts at the town hall and she is forced to save her nemesis, becoming a hero in the process. Of course, the fire was a scheme of Mr. Gold’s and Emma must decide to reveal the truth and look like a fraud, or ride her heroism to a win. She does the noble thing (as if there was any doubt), and her standing up to Mr. Gold bolsters Henry’s confidence and wins the respect of the town – earning her the position of Sheriff. 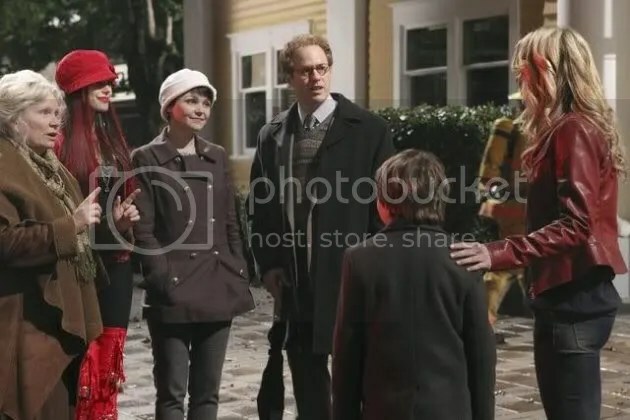 Mr. Gold later stops by the station to congratulate Emma, another “desperate soul” he found to manipulate. He warns her that now that she’s sheriff, he’ll be calling in that favor soon. Mr. Gold – 1; Everyone else – 0.
o Henry was born in jail where Emma was likely forced to give him up. I’m assuming Mr. Gold was the one who made sure she was in prison for his birth. o Mr. Gold proves yet again he’s pulling all the strings, and I’m curious to see how far his plan actually goes. Henry: Good loses. Good always loses because good has to play fair. Evil doesn’t. Mr. Gold: Regina. Should I move some things, make a bit of space for your rage? Regina: Oh, I’m sorry. You didn’t want people to know you cut his cord with a shiv?